The beautiful thing about God is that he knows us - he knows everything about us. God knows us intimately. But do we know him? Where do you want to be in your relationship with God in one year? What about five years? 10? 20? What do you want your kids’ relationship with God to look like? And your grandkids? It starts with you. It starts now. Having an intimate relationship with God and living led by the Holy Spirit isn’t something that happens overnight. It’s not something that you can just click your fingers for and that will happen just like that. It takes time. It takes work. And it takes consistency. 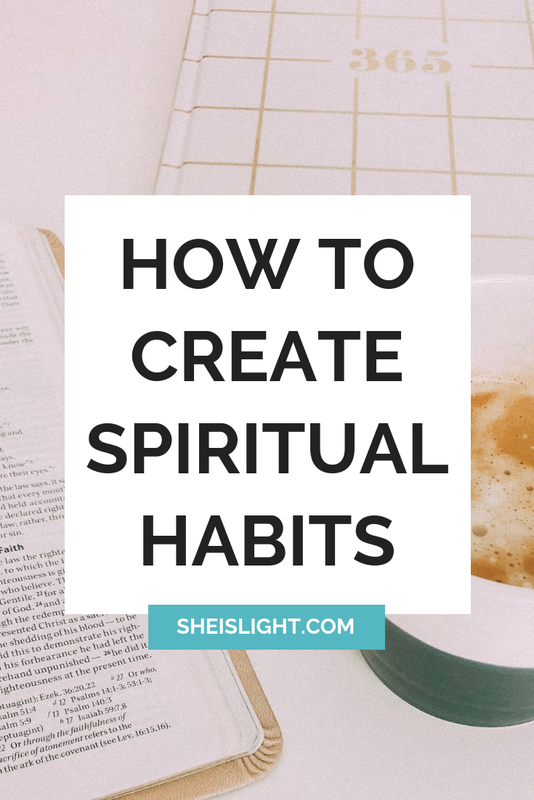 So how do you get that consistency in your life and develop healthy spiritual habits? I want to share three things that I believe will really help you do just this. So often we think we are so busy that there just isn’t enough time in the day to spend with God. If you are so busy that you couldn’t possibly fit time with God into your schedule then you need to reevaluate how you are using your time. Maybe you’re in college and you get up early for track and field practice and then head straight to classes, and then spend the afternoon studying and the evening hanging out with your friends. Maybe your early mornings are all busy and your nights are even more filled to the brim with people to see and things to do. When was the last time you had still, uninterrupted quiet time? When was the last time you really spent time with God? We all have to look ourselves in the mirror and ask ourselves these questions. I think more often than not. A great way to make sure you actually stick to the spiritual habits you’re creating is to keep check with a friend. Do you have someone in your life who could be an accountability partner? You could start by checking in with each other each day to see if you’ve had your quiet time. And then get together once every fortnight or so for a coffee and to chat about the things you’ve been learning, what God has been teaching you, and to pray for each other. What have you been reading in the bible this week? And then commit to checking in with each other each day or couple of days, and praying for one another. This kind of partnership will help keep you both on track and ensure you grow deeper in your relationships with God. I’ve included a little worksheet for you to download below this video. It includes these questions and a space to write down answers. You can print this as many times as you like and make notes each time you meet up with your accountability partner. The hard truth is that as busy as we can be now, we may be even busier in years to come. While we do need to make space in our schedule, and learn to say no to things so we can say yes to God. Today is the best time to spend time with God. Don’t wait until tomorrow. Don’t wait until next week. Don’t wait until months and months and then years have gone by. Ultimately, the key to spending time with God is just to start. Even if you start creating a habit by spending 5 or 10 minutes in the morning praying and reading a few verses of scripture. If you’re just starting out in creating this habit, don’t bite off more than you can chew. Habits are developed over time. So you might start out waking up an extra 15 minutes earlier to spend 10 minutes each day with God, and then that 10 minutes might turn to 20, and that 20 might turn to 30 and that 30 might turn to you being more aware and conscious of God and the Holy Spirit’s prompting throughout your entire day! Ultimately, it’s starting and continuing with these little changes that turn into habits that will transform your life. I’ve created a free, 21-day bible reading plan through the book of John to help you create your daily bible study habit.